The EC Safety Paint Pots Set features specially designed lids with an inward sinking central hole and brush-rest grooves. These ensure that paint can't pour out, if the jar is tipped over, and that the brush tip remains pointed. 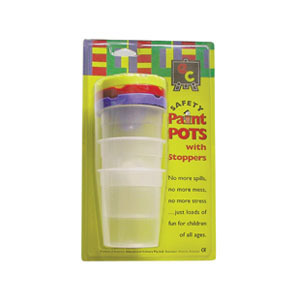 The EC Safety Paint Pots Set also includes stoppers, to prevent paint from drying out.